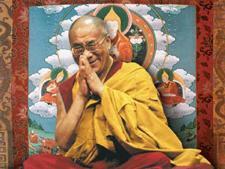 New Delhi, India – His Holiness the Dalai Lama flew from Dharamsala to Delhi yesterday afternoon. Today, he was invited to speak at Salwan Public School in Rajinder Nagar. The school, which is one of a group of eleven, went to great lengths to put on a Tibetan welcome with students making traditional offerings, a welcome arch decorated in Tibetan style and the site festooned with prayer flags. Students made the announcements. After it had been explained that offering light denotes the dawning of wisdom dispelling ignorance, His Holiness participated in lighting a lamp to inaugurate the occasion. In his welcome address, Chairman of the Governors, Kirpal Singh described His Holiness as an apostle of peace, a symbol of love and compassion, a global spiritual leader and an enthusiastic advocate of democracy. He advised the students to listen carefully, because he predicted that this opportunity to listen to him would in future be etched in their memories. Finally, on behalf of the students, teachers, staff and students’ parents he extended a warm welcome to His Holiness almost exactly 20 years since his last visit on 16 November 1997. “Respected elder brothers and sisters,” His Holiness began, as he saluted the teachers, staff and parents, before greeting the students, “and younger brothers and sisters, I am extremely happy and honoured to be with you once more and able to engage with all these young people. I belong to the 20th century and my parents, my teachers and many of my friends have already gone. But when I meet young people like you, I feel younger again too. There are still eight decades of this century yet to come. Those of you who belong to the 21st century have the opportunity—and responsibility— to create a better, more peaceful, compassionate world. Many of my generation will not live to see it, but we place our hopes in you. “Our world has become deeply interdependent. We used to think only of ‘my family’ and ‘my country’, but now we have to extend our concern to the whole world and the 7 billion human beings alive today. If we can all live together in peace and harmony, we will all benefit. We must employ universal values on a global level. Otherwise, simple self-centredness will bring anxiety and stress, which in turn leads to mistrust and even violence. As social animals what we need are friends. When we are surrounded by friends we feel safe and secure. Therefore, it makes sense to extend our concern to the welfare of others in the context of the oneness of all 7 billion human beings. His Holiness observed that despite material development, in many parts of the world there is a moral crisis due to a lack of moral values. He noted that today even religion is used as a ground for conflict. He said that thinking in terms of ‘us’ and ‘them’ stokes more division. He suggested that modern education by itself is not adequate to create a happier, more peaceful world. Only the incorporation of inner values can make it sufficiently holistic in its approach. Learning how to tackle our destructive emotions, something ancient Indian psychology can teach us to do, would result in happier individuals, happier families and an altogether happier world. His Holiness declared that he is committed primarily to promoting human happiness. He went on to explain that he is also committed to fostering inter-religious harmony and he takes great encouragement from India’s being a place where all major religions live together in harmony. Home-grown traditions like the Samkhyas, Buddhism, Jainism, the varieties of Hinduism and Sikhism flourish alongside traditions from abroad—Zoroastrianism, Judaism, Christianity and Islam. In her harmonious diversity India sets an example to the rest of the world. His Holiness also remarked that traditions that cultivate shamatha and vipashyana, as many Indian traditions do, have naturally acquired a rich understanding of the workings of the mind. Through training it’s possible to find peace of mind, which is exceptionally relevant today. He said that just as in aspiring to keep physically fit we maintain physical hygiene, so, in aiming to be mentally fit, we should also cultivate emotional hygiene. As a consequence, His Holiness has announced that he is committed to encouraging a revival of ancient Indian knowledge in India. He has requested that Tibetan monks proficient in the Nalanda Tradition in the Buddhist monasteries in South India learn English and Hindi to assist in this project. 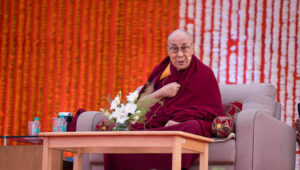 “Tibetans have historically regarded Indians as their gurus and themselves as chelas or students,” His Holiness explained. “But while much of the knowledge that was imparted more than a thousand years ago has been neglected in its country of origin, Tibetans have kept it alive. Consequently we have proved ourselves to be reliable chelas. In answering several questions from the students His Holiness explained how anger and attachment are part of our lives but tend to arise from a narrow-minded, self-centred point of view. Therefore, it is better to reduce them in day to day life. Concerned about protecting the natural environment, he expressed disappointment that America, a leader of the free world, is withdrawing from the Paris accord. He also mentioned the urgency of addressing the huge gap between rich and poor in many parts of the world. He concluded by recalling the suffering that marked the 20th century and encouraged the young generation of the 21st century to change the trend, not by relying on prayers and good wishes, but by taking realistic action to create a happier more peaceful world. During the words of thanks, students were urged to make a pledge to themselves to follow His Holiness’s advice to overcome negativity, hatred and jealousy and instead to foster a sense of love for humanity and the natural world. Many of the students’ parents lined the red carpet as His Holiness left the venue. He greeted, shook hands and let his photograph be taken with many of them. Before his final departure, he planted a sapling as ‘a reminder to future generations to uphold the values of generosity and compassion’.